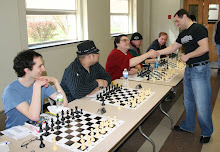 Last Saturday, the Kings Knight Chess Club Challenge took place at Hudson Mall in Jersey City. At Contre Gambit Philidor, Frederic Fournier analyzes two recent games of mine as Black in the Philidor Counter Gambit, against James Drasher and Alice Dong respectively. 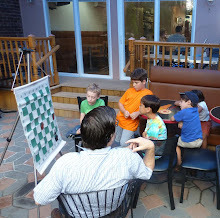 My first round game against Lev Zilbermintz in Westfield was not a PCG because I opened with 1.b3 in order to avoid it! During the Westfield quads on Sunday, I took the following pictures. On Sunday, I won the following game at the quads in Westfield. 32.g5 Rc1+ 33.Kh2 Ng4+ 34.Kh3 Rxe5 35.dxe5 Rc3+ 36.Bf3 Rxf3+ 37.Kg2 Rxf2+ 38.Qxf2 Nxf2 39.Kxf2 Bd5 40.a3 b5 41.Ke3 Kb7, White forfeits. 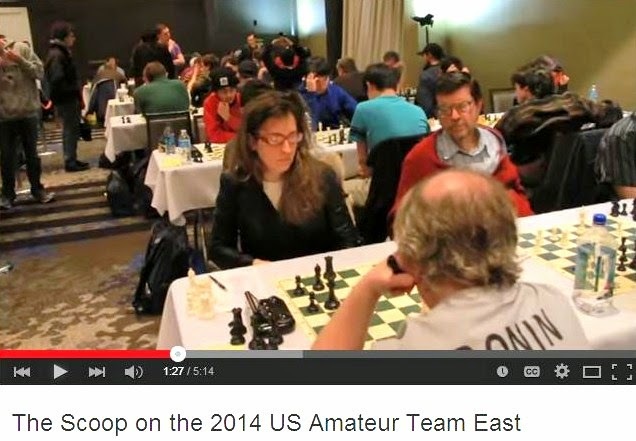 Yesterday the United States Amateur Team playoffs were won by the team from the South, "Armageddon Your Pieces" [pictured]. They defeated "West Orange Krush" and "For Whom the Azbel Tolls" to take the title. 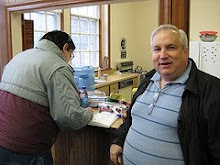 Before the start of Thursday night's game/30 tournament at the Marshall Chess Club, I snapped these photos. 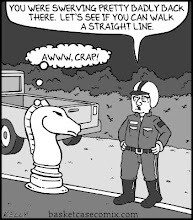 Last night, I drew this game at the Marshall Chess Club in a game/30 tournament. 38.Nb3 Kg6 39.Nd4 Bd7 40.Ne2 Kh5 41.Kd4 Kg4 42.Ke3 Bc8 43.Kf2 Kh3 44.Ke3 Kg2 45.Nd4 Kxg3 46.Ne2+ Kg4 47.Nd4 Bd7 48.a5 Kh5 49.Ne2 Kg6 50.Nd4 Kf6 51.Ne2 Be8 52.Nd4 Bh5 53.Nc2 Bg4 54.Nd4 Ke7 55.Nc2 Bh3 56.Kd4 Kf6 57.Ke3 Bf1 58.Kf2 Bc4 59.Nd4, draw. 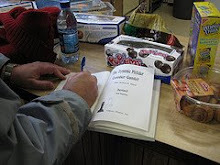 Last weekend, while playing in tournaments at the Marshall Chess Club, I took these pictures. 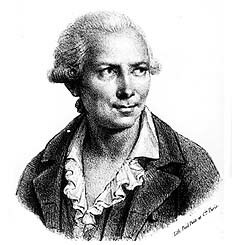 At Contre Gambit Philidor, Frederic Fournier likes my game as Black against Ilan Kreitner. In The New Yorker, movies editor Richard Brody [pictured] remembers former U.S. junior chess champion Peter Winston who disappeared mysteriously in 1978 after a disastrous tournament. Although advertised as Marshall CC Game/35 Swiss, yesterday's tournament at the Marshall Chess Club had a time control of game/30. 51.Kd4 Rxf5 52.Kxc4 Rf4+ 53.Kxb3 Rxh4 54.Rf3 Ke5 55.Ka3 f5 56.b4 Ke4 57.Rf1 Rg4 58.Ka4 f4 59.b5 Rg6 60.Ka5 Ke3 61.Rc1 f3 62.Rc6 Rg5 63.Re6+ Kf2 64.Ka6 Kg2 65.b6 f2 66.Re2 Kg1, White resigns. 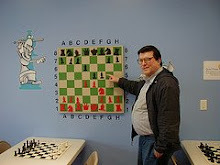 In yesterday's game/60 Swiss at the Marshall Chess Club, I won this game. 33.Bc1 Bxf3 34.Nxd4 Nxd4 35.Rxd4 Rg1+ 36.Kd2 h5 37.Rd6+ Kf5 38.Kc2 Rg2+ 39.Kc3 h4 40.Rd4 Rg4 41.Be3 h3 42.Rd8 h2 43.Rf8+, White forfeits. 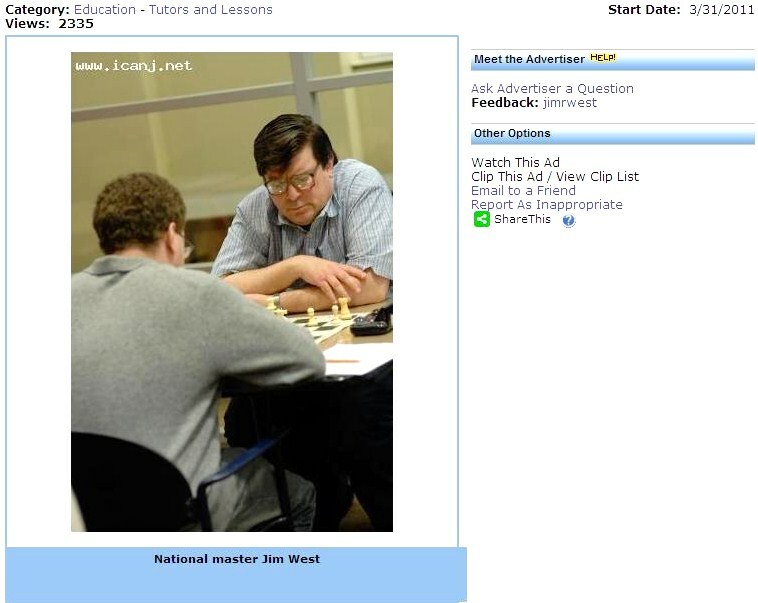 The Guide to Online Schools has a list of 30 Terrific Chess Blogs. Their favorite blogger is Atomic Patzer [pictured]. 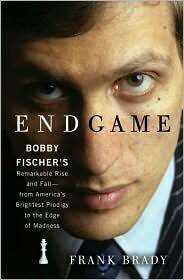 More Book Reviews of "Endgame"
Here are more book reviews of Frank Brady's Endgame at OregonLive, Chessvine, and Failure Magazine. Gee - West @ "Contre Gambit Philidor"
At Contre Gambit Philidor, Frederic Fournier provides a link to my game as Black against Howard Gee [pictured]. You can watch the second part of the Liz Garbus interview by Elliot Kotek. 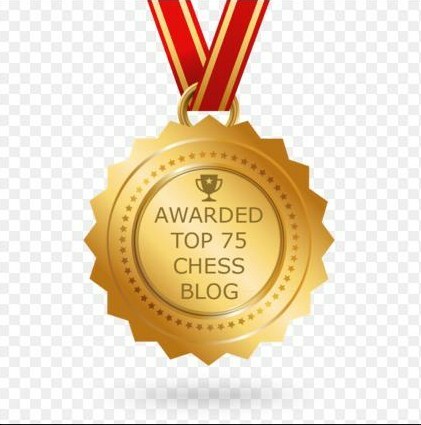 World Blitz Chess Association (WBCA) rules—USCF membership NOT required! 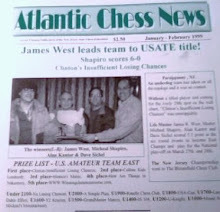 This tournament has been made possible through the generosity of Mr. Paul M. Albert Jr.
On Sunday, I drew this game in the NYC Senior Championship tournament at the Marshall Chess Club. 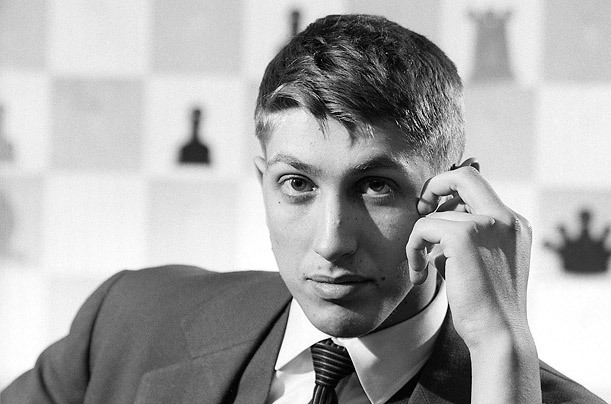 31.Rc4 c5 32.Bf4 Bb5 33.Re4 Re8 34.Rxe8+ Bxe8 35.Bxd6 Bf7 36.Bxc5 Bxd5 37.a3 Bb3 38.Kf2 Kf7 39.Ke3 Ke6 40.Bd4 Kd5 41.Bc3 Kc4 42.Kd2 Kd5 43.Kd3 Bc4+ 44.Ke3 Bb3 45.Bf6 Kc4 46.Kd2 Kd5 47.Ke3 Kc4, draw. 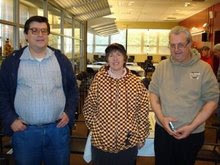 Yesterday I had a "senior moment" in the NYC Senior Championship, being held at the Marshall Chess Club. I played 39.Re2?! instead of 39.Re4 but still managed to draw. 60.Bf3 Rg6+ 61.Kh1 Kxf3 62.Rxd3+ Ke2 63.Rb3 f3 64.Rb2+ Ke3 65.Rb3+ Ke4 66.Rb4+ Ke5 67.Rb5+ Ke6 68.Rb2 Rf6 69.Kg1 Rg6+ 70.Kf1 Rg2 71.Rb3 Rxh2 72.Rxf3 Rb2 73.Rh3 Kd5 74.Ke1 Rxb6 75.Rxh7 Re6+ 76.Kd2, draw. I.S. 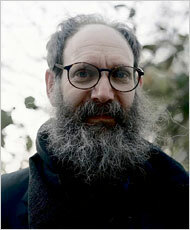 318 in "American Teacher"
Lev Zilbermintz @ "Contre Gambit Philidor"